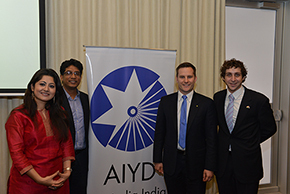 The AIYD is pleased to announce the programme for AIYD 2015. The programme includes speakers such as Pinky Anand, Additional Solicitor General of India; Prof Rosalind Croucher, President of the Australian Law Reform Commission, Sunjay Sudhir, Indian Consul General in Sydney and Ric Wells, Deputy Secretary DFAT, amongst other high-profile speakers. For details of the complete programme, please click here.